Two weeks after obtaining my master’s degree, I spontaneously found myself on a month-long backpacking trip across Indonesia with my friend from New Zealand. 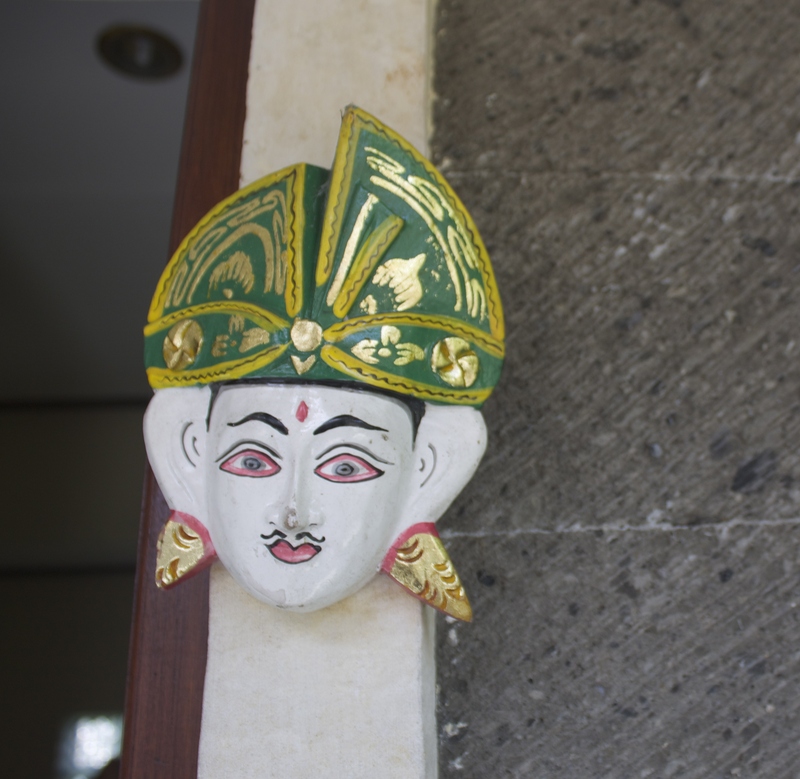 These bathroom doors feature “His and Her” small masks at Goa Gojah, from the Island of Bali, Indonesia. 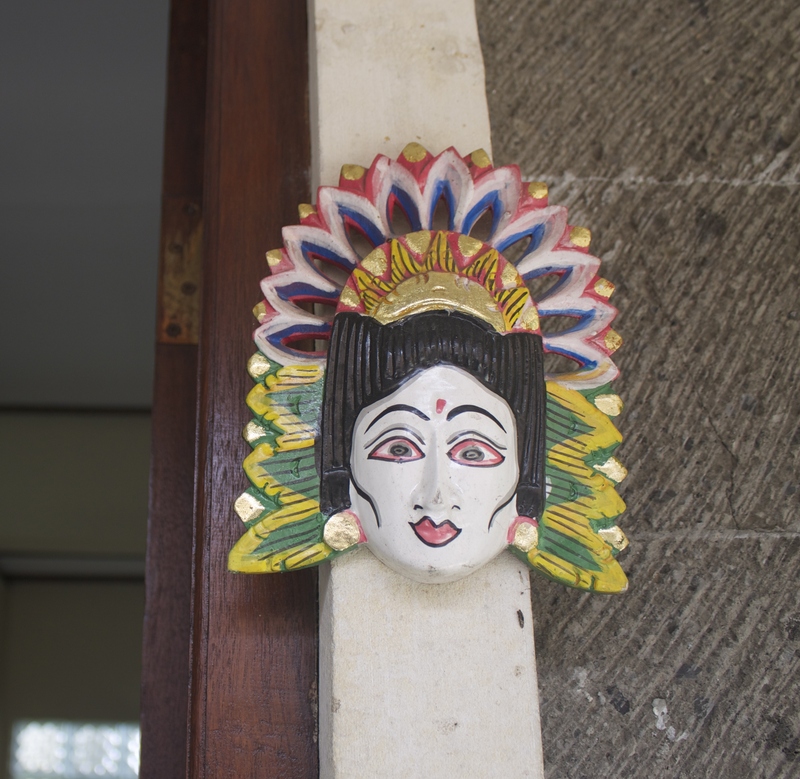 The door below comes from Ngurah Rai International Airport on the Island of Bali. 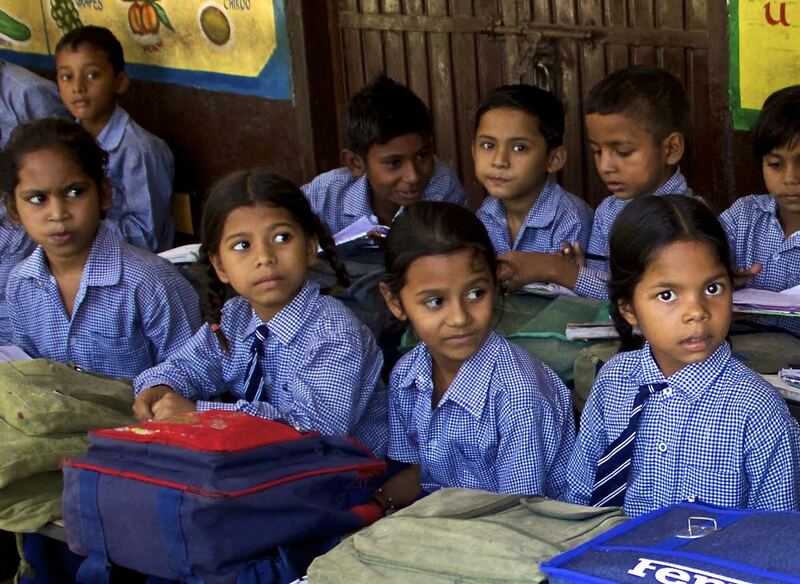 After a month in Indonesia, a pit stop in Australia, and two weeks back in the United States to wait for a visa, I flew to India for a job working for the Haryana government project for government-run schools. You can read more about my work in India here. Anyone who has traveled outside of the Western world knows that bathroom “norms” take all kinds of shapes, sizes, (and smells) around the world. 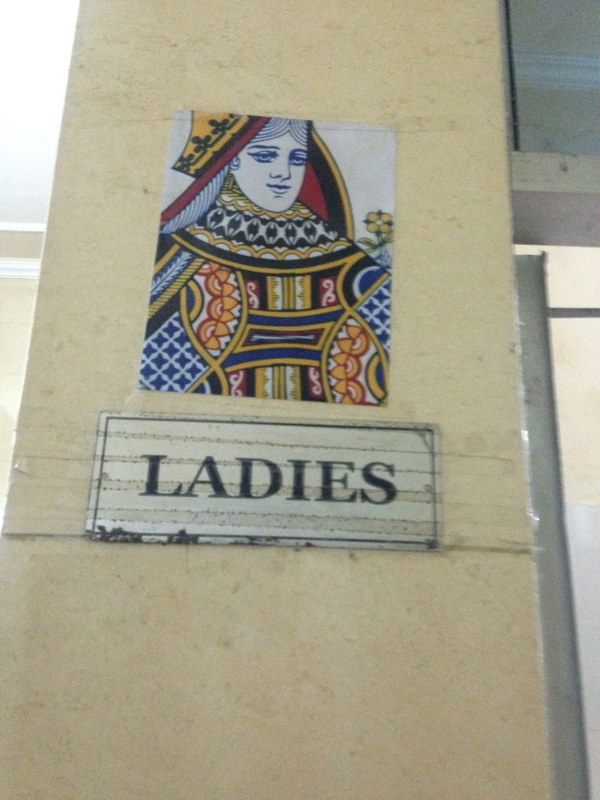 I’ve seen all sorts of bathrooms since arriving in India four months ago. 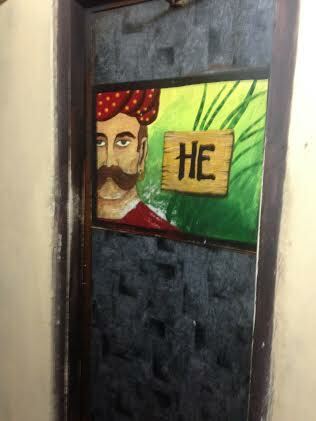 Some bathrooms are quite upscale and conventional according to Western norms such as this bathroom at Satva Restaurant and lounge in Chandigarh, India. 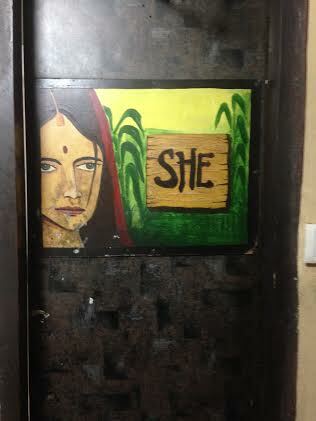 Or the bathrooms behind these painted doors at Pashtun, one of the oldest restaurants in the city. 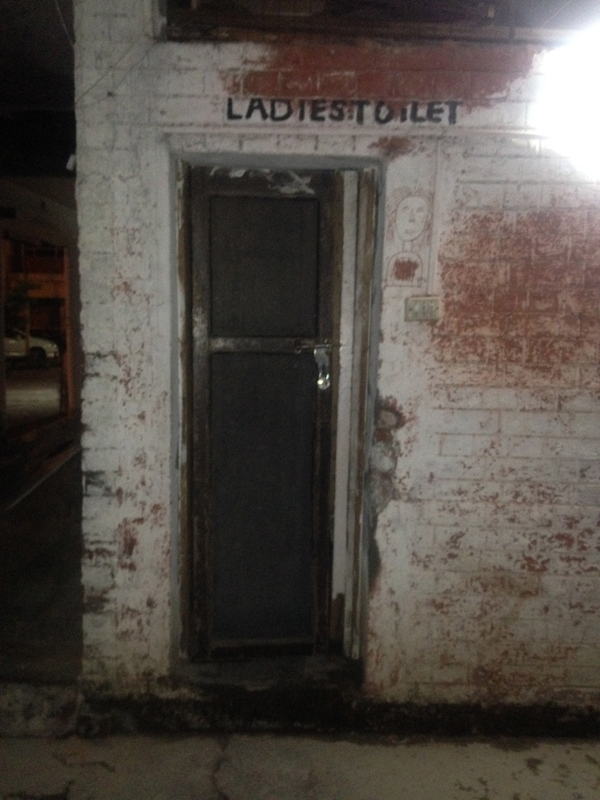 Other bathrooms have been just downright terrifying like this toilet in the Sector 8 Panchkula market. It was locked, but I did appreciate the little pencil drawing of a woman on the outside wall. Here’s a good example of some of the things one needs to get used to in India: used pads on the ground of a very wet and dirty public restroom in Chandigarh. The next stall was streaked with blood. 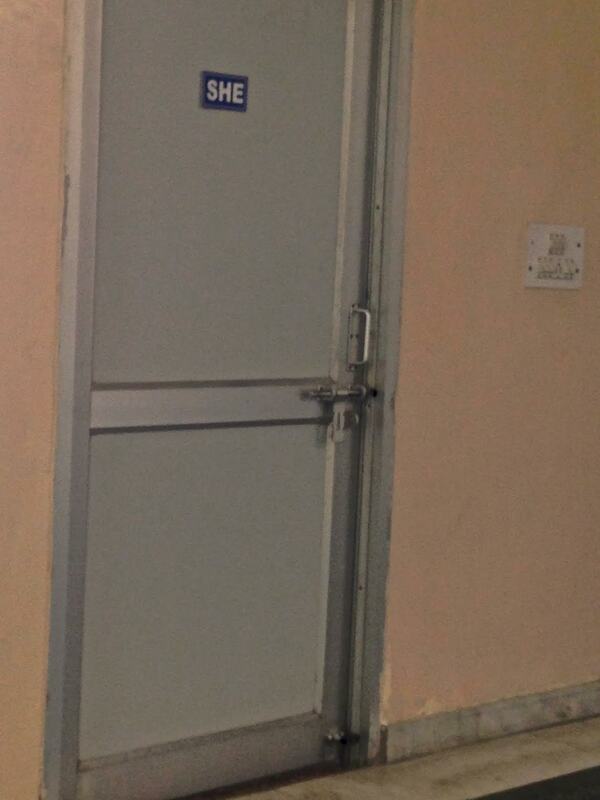 The ladies rooms in Shiksha Sadan, the government office where I work in Panchkula, are perfectly sanitary although a bit sparse. The deadbolt on the outside makes me quite nervous. My colleague is in fear she will be locked inside one night while working late. There are things one must get used to, of course, including the necessity of sometimes using squat toilets (fortunately, the government offices have both these and Western toilets) and the absence of toilet paper in most establishments (unfortunately, none is provided in the government offices, but I have a few rolls stored in my desk). In India, water is considered to be the most hygienic means of cleaning oneself after using the bathroom. From what I understand, you turn on the faucet to get fresh water from the tap and then wash yourself using your hand. The water runs into the bucket that you can use to “flush” the toilet by dumping it down the hole and cleaning the basin in the process. Often western toilets also have a little hose you can use to clean yourself off. In this sense, there isn’t a problem with germs. Actually I think a lot of people think it is more hygienic to use water. However, I still haven’t figured out how you “dry” yourself after all this. In villages though, I could see a potential for problems if there isn’t running water and people are using one pot of water for cleaning. But I don’t have much experience with this and shouldn’t comment. I rarely know when toilet paper is going to be provided. (It is at my gym, the mall, and most night clubs). An intelligent person would carry a pack of tissues with them everywhere, which I did when I lived in the Middle East last summer. However, I’ve gotten lazy here since I spend most of my time at work. That being said, I have been in a pinch a few times now. None of my Indian friends seem to believe in paper over water. I’ve had more than a few disappointing moments when going to friends’ houses and getting stuck the whole night with just a bucket of water and my sense of adventure. 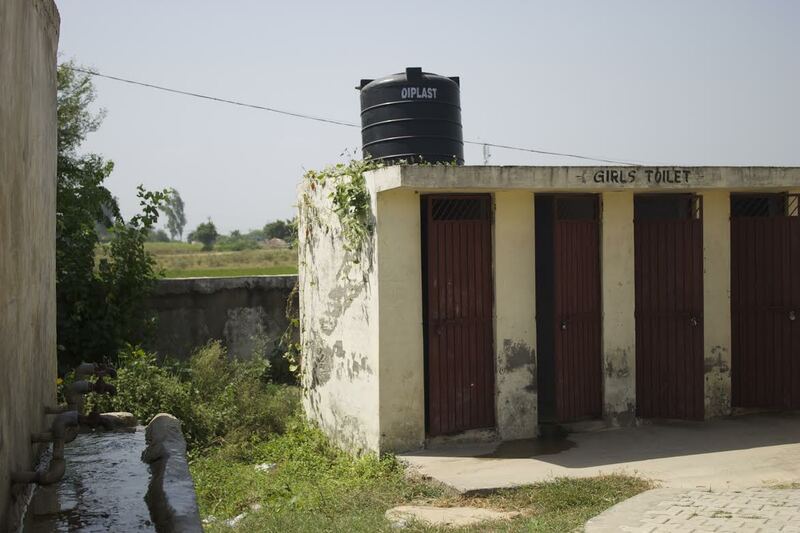 This is the toilet for a school in Kundi (part of Panchkula). The school has about 300 children. There are two of these. 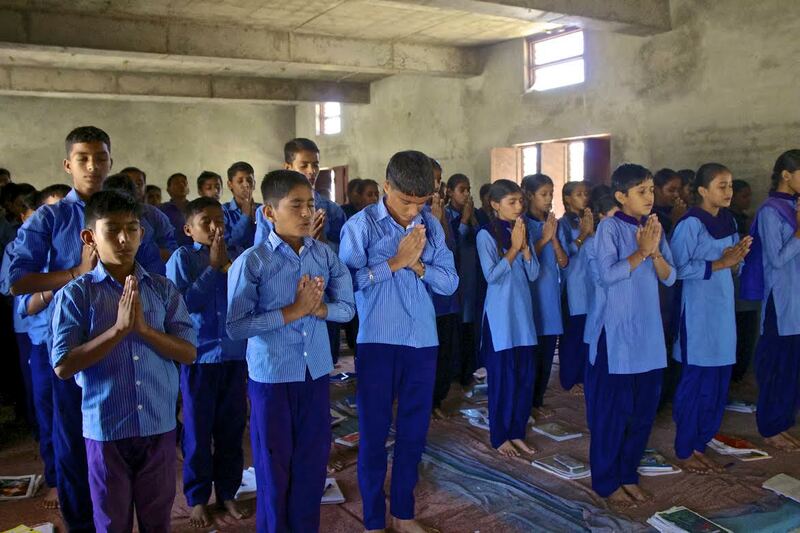 Here are some primary students in class. These secondary students are taking a yoga class. 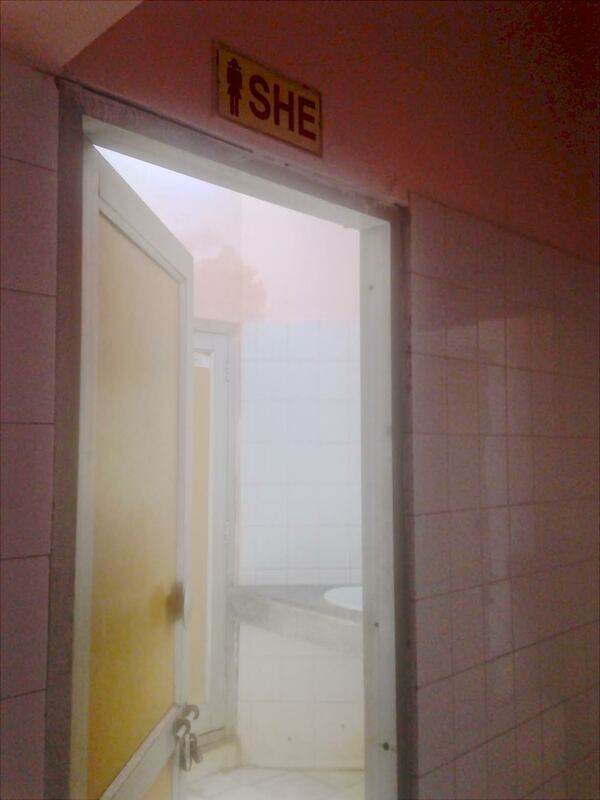 In conclusion, the bathrooms in India are part of the experience. It would be easy to categorize them all as “less than sanitary” (many Westerners have). 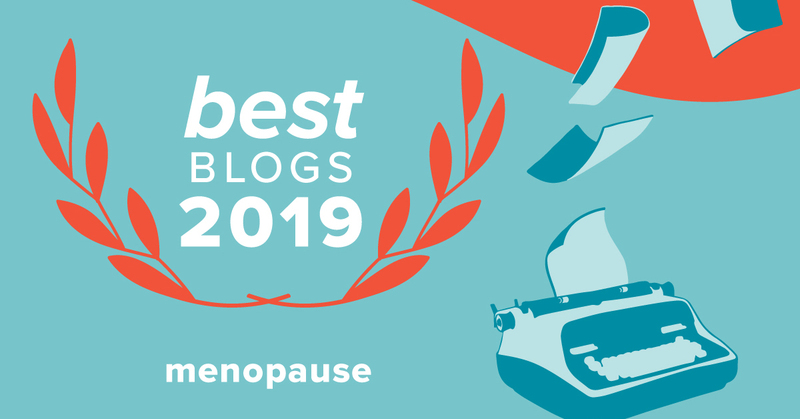 However, having traveled around the world and after living in a few developing countries, I think it’s more important to realize that our sense of cleanliness and hygiene is mostly a privilege, and in some cases, strictly cultural. Many people actually prefer the squat toilet and water, and perhaps find them more sanitary than our Western bathroom practices. Gwendolyn Bellinger graduated in June ’15 from the University of Chicago, after studying Arabic, Islamic finance, and Gulf aviation. She currently works in Panchkula, India, on a project to increase the quality of public education in the state of Haryana. In her spare time, she enjoys gallivanting around the world with just a backpack; trying to learn new languages; and pursuing her hobbies of reading, writing, photography, and videography. Gwen is the daughter of my good friend and faithful blog reader, Susan Bellinger. 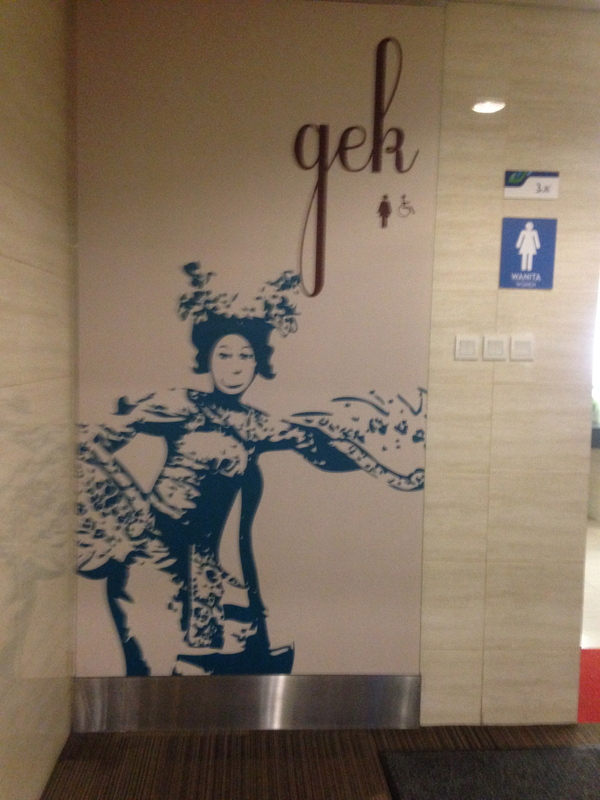 Check out Gwen’s fascinating travel blog, Gwen Goes Global. Learn more about the work she is doing on the team website, Qip Haryana.